Do you want the strength of undefeated boxer Laila Ali or the body of heavyweight champion Lennox Lewis? You don't have to step into the ring to get a great workout. 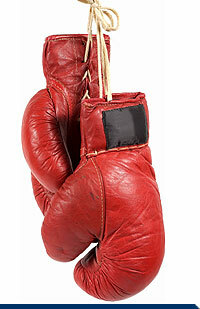 Boxing classes are becoming the norm in many health clubs and fitness centers across the country. Participants are learning what boxing enthusiasts have known for years--that boxers are some of the most highly conditioned athletes competing in sports today, and that if you follow some simple procedures, you can build stamina, tone your muscles and burn calories. "Boxing is one of the best exercises. You work all of the muscles in the body," says Terrence Blackmoore, a trainer at Gleason's Gym in Brooklyn. "More people are becoming interested in the sport as exercise. Women are crazy for boxing right now ... It's a whole-body workout." For the most part, women are behind the increased interest in the sport, experts say. As more women get their hands and wrists wrapped and lace up the gloves in amateur and professional boxing, health-conscious women are beginning to use boxing for fitness. "I always wanted to learn kickboxing for fitness," says Mea Robinson-Davis, who takes a class at Chicago's New City YMCA. "It's an excellent cardiovascular workout, and you learn a skill." There is a difference between boxing professionally and working out alongside your fellow classmates in the safety of a health club. Although professionals are at greater risk for head and neck injuries, most health and fitness experts urge newcomers to confine their fisticuffs to the gyms, where boxing classes will help to improve your cardiovascular fitness, flexibility and coordination. "I think anybody who tries it knows that it takes a lot more work than anything else," says Terry Southerland, a trainer and boxer who teaches boxing classes at Crunch Fitness in New York. "Nothing takes more energy." For those of you who are thinking about boxing for better health, here's a little primer to see if you're up to the challenge. As with any exercise program, consult with your doctor before starting. And if you want a more intense workout, you may want to head to your local gym and hire a professional trainer to put you through your paces. As with any workout, you'll need to warm up to get your heart pumping. Jump rope for 10-15 minutes. Start off on the balls of your feet, tuck your elbows and use your wrists to rotate the rope. When you're comfortable jumping with both feet at the same time, shift your weight from each foot with each rotation. Don't worry if your technique doesn't match that of the professionals. You'll get the hang of it. If you need a break, rest for one minute every three to four minutes, and then begin again. Now that you've warmed up, it's time to learn the basics. The proper form and technique are key in making sure that you get the best workout possible while avoiding injuries. A proper stance allows you to throw harder punches and get a better workout. Stand with your feet hip-width apart and knees slightly bent. Balance on the balls of your feet and take a natural step forward with your left foot (step forward with your right foot if you're left-handed). Bring your hands up to cheekbone level, keep elbows tucked and your chin down. Remember to keep your abs tight, as if you were doing a sit-up. Stay light on your feet as you move around, and lightly bounce, shifting your weight back and forth. Keep your knees soft throughout the workout. There are six punches in the book of boxing, says Blackmoore, who has trained celebrities like Sean (Puffy) Combs. It's all about the coordination of body movement. The two that are probably easiest to learn are the jab and the uppercut. When throwing these basic punches, never lock your elbow, because that can cause serious joint injuries. The jab is a quick punch with a snap to it and is most often used to set up other punches. Push off the ball of your back foot, take a small step forward with your front foot and explode your left fist out. From the left-handed stance, you'll jab with your right fist. Rotate your shoulders, palm facing down, and extend your punch. Don't lock your elbow. Snap your fist back into position quickly as you step back into your original stance. The uppercut is a punch that lands with your palm facing your body and your fist pointed up toward the ceiling. Bend your knees and tuck the elbow of your punching arm into your hip. Thrust with your hips and drive your punch upward, keeping your elbow bent at a 90-degree angle or greater. If your gym doesn't have a heavy bag, you can shadow box with an imaginary opponent. While you don't need gloves for shadow boxing, the extra weight only adds to your workout. Your workout should consist of 3- to 4-minute rounds, where you do combination punches, move around the bag or room if you're shadow boxing and concentrate on your footwork, says Southerland. If you get tired, slow your pace, take deep breaths and keep going. The stronger you get, the longer you'll be able to go. For a 3-minute cool down, slowly shadow box, in front of a mirror if possible, checking your form and technique. Practice all of your punches, slowly reviewing everything you've worked on as your heart rate slows and your body begins to cool. Always remember to stretch before and after your workouts. And when you've been at it for a little while, you'll begin to notice a difference, say trainers and participants. "The biggest benefit for most people is a higher confidence level," Southerland says. "They're a lot more self-confident after they've taken it for a little while." COPYRIGHT 2001 Johnson Publishing Co.